A Newcastle University expert is leading a new study which aims to resolve a longstanding debate about how and when people first came to the Americas. Dr Lisa-Marie Shillito, a lecturer in landscape archaeology, is using a microscopic technique to analyse organic matter and sediment at the Paisley Cave archeological site in Oregon's Lake County, USA. She is part of an international team including University of Oregon archeologist Dennis Jenkins, who is well known for his work in the caves. He uncovered long-dried-out faeces, known as coprolites, that were later identified as being from humans based on the DNA they contained. The coprolites, radiocarbon dated to as much as 14,300 years ago, distinguish the Paisley Caves as one of the earliest human occupation sites in North America—one that predates by at least 1,000 years the Clovis culture, long considered the continent's oldest cultural tradition. However, questions remain, particularly among archaeologists who advocate for the 'Clovis First' model for the peopling of the Americas. The new study, funded by the UK's Natural Environment Research Council, aims to find the answer to those questions. Dr Shillito will analyse organic matter and sediment in the soil of Cave 2 to confirm the age of the coprolites. By examining the concentration of certain types of lipids—organic matter left by biological organisms—throughout the cave's sediment layers, Shillito and the team will assess how much movement has occurred over time in the archaeological deposits. "Think of it as an archaeological excavation under the microscope," she said. "Intact blocks of sediments are set in resin and turned into slides for viewing under a microscope. This way we can visually examine the processes by which sediments have been deposited, and whether they have been subsequently altered. We can resolve the fine layers and establish precise sequences of events." In addition to the lipid study, the team will take extensive sediment samples for additional analysis. Dr Shillito and project co-investigator Ian Bull, a chemist at the University of Bristol, have used this new combination of methods in past projects, including at the famous Catalhoyuk site in Turkey. Shillito, Bull and Jenkins are joined on the project by University of Copenhagen geologist Thomas Stafford, who has been a key figure in developing the evidence for pre-Clovis North American settlement. Geoarcheology research associate Dr John Blong from Newcastle University's School of History, Classics and Archaeology, will be carrying out laboratory work. "Thanks to years of detailed excavation data on the Paisley Caves' stratigraphy and archaeology—not to mention an archive of 1,800 coprolites curated by Jenkins at the Museum of Natural and Cultural History—we have a well-documented context for conducting this investigation," said Dr Shillito. 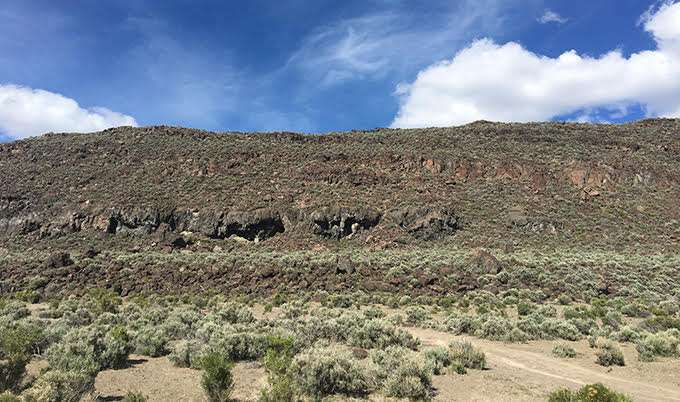 "Based on the site's stratigraphy, we know there were a lot of people visiting the caves between 12,600 and 12,000 years ago," Jenkins said. "Did some of their DNA get flushed to deeper sediments via water activity in the cave? Is the DNA as old as the 14,000-year-old layer we found it in? Did the human DNA enter the cave by some other means like animal activity? These are the kinds of questions we'll be able to answer as a result of this project." I have been to the Paisley caves, been around that whole ediface and complex. Is all well overgrown with sagebrush now but at one time was rather lush and much more forgiving of a land than it is now. We stayed out of the caves so as to not disturb the contents. This was some 40 years ago, and it has obviously not changed much at all since.